WASHINGTON (February 5, 2019)—Travel to and within the U.S. grew 3.6 percent year-over-year in December, according to the U.S. Travel Association's latest Travel Trends Index (TTI)—marking the industry's 108th straight month of overall expansion. The growth trend is tempered by concerning signs in the lucrative international inbound market, however. That segment grew at a rate of 2.8 percent in December—well off November's hot pace of 3.8 percent growth year-over-year. 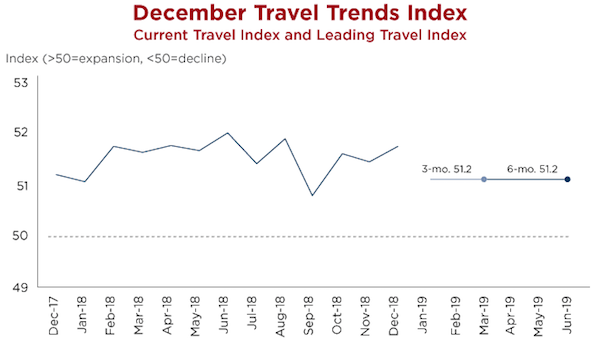 Worse, the deceleration trend is expected to continue, with the Leading Travel Index (LTI) projecting international inbound travel to slow to 2.0 percent through June 2019. "A projected global economic cooling and persistent trade tensions will continue to threaten international inbound travel growth," said U.S. Travel Senior Vice President for Research David Huether. "The expected softening of the dollar and the de-escalation of the U.S.-China trade conflict should be positives for the international segment, but the market will not be able to fully capitalize on those advantages without some help." The TTI's bright spot is the strength of domestic travel: Domestic leisure travel registered 4.0 percent growth in December, while the business segment increased by a more modest 2.6 percent. Travel Trends Index: Does a "Trump Bump" Get Credit for Surging Travel Forecasts?